and our special booklet, Fallingwater: A Long Family Affair. In the years before Fallingwater® was designed by Frank Lloyd Wright for the Edgar J. Kaufmann department store family of Pittsburgh, the spectacular landscape was owned by the Masonic Country Club and later by the Syria Improvement Association, an arm of the Masons. The Masons built a club house, a dance pavilion, cottages and other buildings for use by members as a weekend retreat. 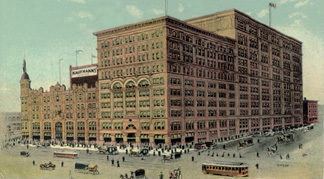 Later, in about 1913, the Kaufmann's Department Store bought the property for use by its women employees as a summer club. By the 1920s, according to Donald Hoffman's book, Frank Lloyd Wright's Fallingwater: The House and Its History, the grounds were used for "tennis, swimming, volleyball, hiking, hayrides, picnicking, sunbathing, singing, theatre and 'quiet' reading." The Kaufmanns bought the property outright in about 1932, and within a few years designs for Fallingwater were underway. Cousins who worked at Fallingwater under the Kaufmanns over the decades from the 1930s to the 1990s, and honored at our 2004 national family reunion, were Ralph Miner, Lester and Mildred (Anderson) Miner, Oakey and Gertrude (Shroyer) Harbaugh, and Frank Miner. Above left: the rocky waters of Bear Run. 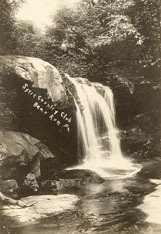 Right: men apparently capturing pure mountain water along Bear Run's "Silver Spring." 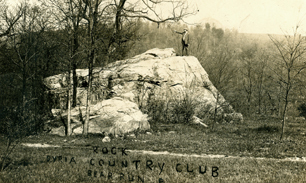 Above left and right: unknown man in suit and hat stands atop a large rock on the Syria Country Club property, circa 1909, near what at that time was the Lindsay Cottage and today is behind the maintenance building at Fallingwater. Above left: the famed "Hangover" cabin that Edgar and Liliane Kaufmann built circa 1921 for use on weekends, about 1,500 feet to the southeast of the falls where Fallingwater would someday emerge. Above right: the "Spray Rock Cottage" also known as the Porter cottage where Fallingwater's guest house now stands. Above: two views of the famed "Club House" built by the Masonic Country Club, about 1,100 feet to the southeast of the falls. Above left: the "Club House." Above right: a quiet road leading to the property. Above left: the "Back to Nature" cottages. Right: the Arbutus cottage. Above left: a trout hatchery located just a few hundred feet upstream from the falls. Right: the Stone cottage. Copyright © 2004-2006, 2009-2010, 2014 Mark A. Miner. All images courtesy of the Minerd.com Archives.